Pink Penguin: Don't Be Crabby Bag + Giveaway! Don't Be Crabby Bag + Giveaway! I had several ideas of projects for these fabrics, but I ended up with this bag. I was able to use all the 10 different fabrics for it! Here is the other side of the same bag. And here is the bottom! 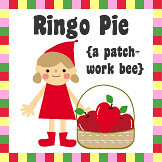 It will be a birthday gift for a two-year-old I used to babysit. The bag is filled with lots of goodies and is going to fly across the ocean soon! Not sure if he remembers me (probably not! ), but he'll definitely enjoy seeing the sea animals on his bag! And it makes 'me' feel good to be able to make something to show him how much he is cared for by us. A very lovely bag and a great way to present those gifts!. Love the fabrics! Adorable stuff. Your bag, and the fabrics you're giving away. Thanks for the chance. I love this line! Perfect for little boys. I can't decide if I like the whales, fish, or crabs better! Great bag! Thanks for the opportunity to win this lovely fabric! Aw! I would love to make a beach tote of my own! Pick me! Oh you are so right this fabric is adorable. I love the bag you made and hope to enjoy winning the fabric.. The bag is so cute. Love the crabs! Thanks for the opportunity to win! very cute fabrics. My dauther and her DH are pregnant with their first child and love boating and the ocean. I would LOVE to win these to make them a gift for the new baby! Beautiful! I love the fabrics and your bag is perfect. Laurie Wishbrun's fabrics are SO cheerful and bright! Love them! Beautiful fabrics and the bag is absolutely adorable perfect for a little boy to carry toys around. I love Laurie's fabric lines! They always make me smile and happy. Well, I guess I'll BE GRABBY for the Don't be Crabby FQB. Love the bag you made with the bundle! Summer, where are you??? A beautiful fabric line, and a great-looking bag! I'm following your blog along time ago and I love your creations. And now I love Lurie's fabrics too. This fabric is perfect to Mallorca's summer. My best wishes for you and your lovely family. What Perfect boy fabrics. As I am lucky enough to have 3 grandsons I can think of heaps of things I could do with fat quarters- here's hoping I am lucky. The fabrics are perfect for boys. Thank you so much for the giveaway! I love them! :) I hope the fabrics will be available here, too :). This bag is so lovely, is this your own pattern? Fun prints :) They make me miss the ocean. I really like your idea of using the bag as a gift bag. Thanks for sharing and the give-a-way chance. Love this fabric - and this bag is just gorgeous! Thanks for a fun giveaway! Wonderful bag and fabric, thanks for the chance to win some to make something for the little boys in my life. Love the fabric and your bag is really cool, well done. Great design for a boy! Love the fabrics, just right for summer here. Сумка очень красивая и вместительная)))))Великолепная работа!!! !Летнее настроение! Your bag is adorable! I love Laurie Wisbrun's fabrics too. Thank you for the giveaway! Fun fabric, your bag would be perfect for a trip to the beach. thanks for the chance, really cute line - cuter bag! thanks! That's a very nice bag - lucky boy! I love Laurie's fabrics too. My favourite is still Tufted Tweets, I have a huge stack of chairs and sofas waiting for me to make things. what a lucky boy. the bag is so cute, as is the fabric line. thanks for the chance to win. Laurie makes wonderful and fun fabrics - it looks great as a bag and would especially be a great beach bag or aquafit/gym bag (might motivate me to go more often!!)! Super giveaway thank you! What a great bag and I love the fabrics too; so bright and cheerful. You've done it again, Ayumi! Another fabulous fabric line from Laurie! The bag is very cute and so are the fabrics. Thanks for the giveaway. Earlier this week I spent all evening looking for fishy fabric for a project for a first birthday present. I couldn't find a thing, but this line looks perfect!! Looks like I'll need to get some in and put it to one side for their second birthday! That little bag is so sweet. Thank you for the giveaway. This is a great bag. Is this one of your patterns? I loved the one you made Kerry too. Thanks for the giveaway! The bag is wonderful - thanks for the giveaway! Such a cute bag for cute line.. Love to win some..
my boys would love those prints! Thanks for the give away! Love the colors in this line and your bag is adorable. Lovely bag! Feels like summer on the beach. lovely prints.. and lovely bag! These would make a cool beach quilt and a bag to tuck it into. What a great gift, made with so much love I am sure !! Bag You have done is amazing! So cute and seem to swallow much things! and prints are just lovely! Gorgeous bag! I almost bought some Tufted Tweets and Perfectly Perched from Yuzawaya just because I was so excited to see them there, lol! But I was practical and bought some Art Gallery Fabrics for my sister instead. Sigh. This is the perfect bag for a Florida day at the shore. Thank you for the chance. I want to make something, a bag or purse to take away with me in the mediterranean sea next summer. 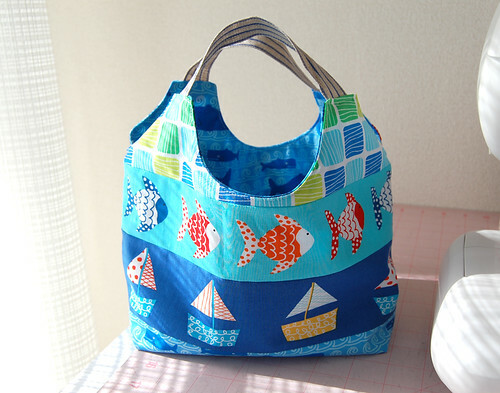 We have autumn now, and this bright bag reminds me about sunny summer! Thanks! Love the bag and the fabric! What a great little bag! The fabric is so colourful and fun! Lovely...the fabric reminds me of the coast of Maine! What a great bag for a 2 year old - but it'd be a great bag for a 52 year old as well. That fabric is so much fun!!!! And your bag is a perfect use of it. What a sweet bag! Thanks for the chance! Those prints look like so much fun! Thanks for the giveaway. What a cute bag. The prints are perfect and you used them so well. Great fabrics! And I love that bag. That it such a cute bag! Love the fabric too. I love the colors and the sea theme. Perfect bag! You did a great job with this bag - i bet the little kid will enjoy it. Such a cute bag! Love Laurie's new line of fabric! Great bag - what a lovely pressie. I would be so happy to win this giveaway, so I will keep my fingers tightly crossed. Love the bag, I'm sure he'll enjoy it. All L. Wisburn's fabric lines have been great. Love to win some, I still need to get some of the donkeys. That bag is great! I love those crabs; they crack me up! Love the bag and the fabric! Thanks for he opportunity! Love this bag - I am sure that recipient will make great use of it. Thanks for sharing and for the chance to win! oh my goodness! What adorable fabric & love your bag too. Hoping to win. Your bag is SO cute! What fun fabric!! Love the bag. Cute! Cute bag! I love Laurie Wisbrun's fabric! what wonderful fabric and nice use in the fun bag!!!! Adorable fabric by Laurie as usual! Love your bag! That bag is so sweet, perfect for a little guy. The fabrics are just yummy too! Love the bag! It shows off the fabric so beautifully!!! 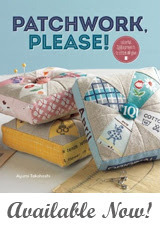 :) And what a cute fabric collection!!! The fabric is adorable and I know a little man who would love that same bag. Thanks for the opportunity. Would love to make a boy quilt out of this bundle! Very cute! I'm sure your little friend will enjoy his present! Adorable bag, Ayumi! The fabric is lovely and looks like it's fun to work with! Please count me in and thank you. Cute fabric! My boys would love these! They are very curious about water and ocean creatures right now...thanks! So cute. Love those little crabs! I love the bag & so will he! What a fun package to get in the mail! that bag is the cutest bag ever, love the fabrics & how you put everything together, too. Just wow. I love these fabrics and the bag is adorable! Thank you for a chance to win!! The fabric is awesome. The bag you made is great. Great idea for all sea- lovers! Colourful fabric, that brings hot sommer back in mind. Definitely hard to be crabby when looking at the fabric. All her designs make me smile and this is no exception. Congratulations for the bag, it is lovely! What cute fabrics. And the bag is adorable. He's going to love it. Thanks for the chance to win some of that fabric. Those fabrics are stinkin cute and what an adorable bag! And thanks for sharing them with us in this great giveaway! :) Good luck everyone participating! What an adorable bag from adorable fabrics! The bag is gorgeous, never mind a 2 year old, I'd love it too ...... I'd love to have a go using some of this gorgeous fabrics. I love the little sea creatures! Especially the whales :) adorable bag! I'm sure it will be very loved and appreciated. That bag is seriously cute - I'll add my voice to the others that are asking which pattern you used? 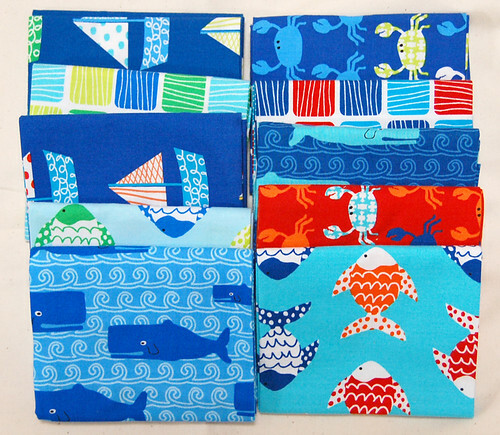 Thank you for the opportunity to win such a fun set of fabrics - especially those fun crabs, lol! I love this fabric so much. It is just beautiful and fun. Thanks for the chance to win some. I love the peek of red on the bottom. So cute! Love the bag! Thanks for the chance to win some of the cute fabric! Love the blog and the fabric is awesome. My DD would love it. She loves crabs (has some as pets) and coincidentally was very crabby today. Maybe I need to show her some love and make something for her. 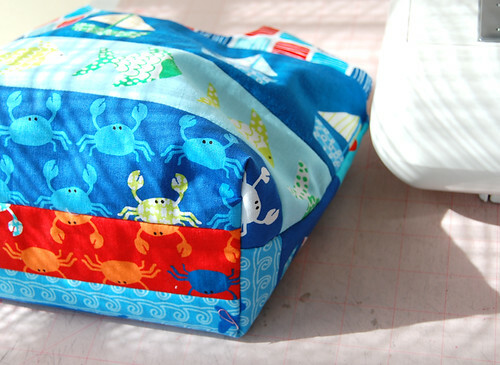 I've been collcting crabby fabrics for a year...they are hard to find! These are perfect...thank you! 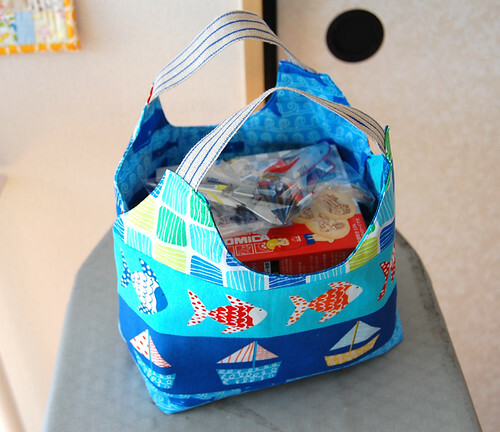 This fabric is so cute and the bag is perfect for a little boy! I'd love to win ~ thanks so much for the chance! The bag is beautiful and thanks for the giveaway. Love your bag and the fabric! Thanks so much! Your bag is so cute! The bottom is almost as pretty as the rest of the bag:)That little boy will love, love, love the gift!!! the bag is adorable and the fabrics are fantastic, thanks for the chance to win! thanks for the chance to win. Is there a pattern for the bag or a tutorial? What wonderful fabrics for a little boys Quilt. Thnaks for the chance to win and love the bag! What a cute bag and it really shows off this cute fabric. Love them both. We are definitely into everything beachy/nautical so this fabric is perfect for so many of my projects, but I so want to make that cute bag! I adore this line of fabric, and what a fun birthday gift for a little one! Those whales kill me! So cute! what a lucky two year old he is! lovely fabric and a sweet bag. This is such cute fabric & what a great way to use & display it. Thanks for the chance. I LOVE this! The fabric is beautiful and fun and your bag is the sweetest! I am always looking for a pattern that I can use multiple fabric in. This is perfectly Auymills...Thank you for sharing. OMG this fabric line is sooooo sweet!!! I love it! I love the bag you made too! Thanks for the chance - it would be awesome to win!! Hi! Great bag...love the size. And the fabrics are perfect....so cute. Thanks for the giveaway. That looks like sucha practical, awesome bag! I just might have to try it! How cute is that! I love Laurie's fabrics! Gorgeous bag! I hope the little one likes it! Thanks for the giveaway! This fabric is so cute and your bag is simply adorable!!! So adorable...the fabric and the bag! Such a cute bag! I'm sure it will be so loved and appreciated! Laurie Wishbrun is so talented and I love her fabric! Thanks! The bag is fabulous! And Laurie's fabrics are always darling. Thanks for the chance to win! I'm a big fan of Laurie's designs too!! That bag is really cute and looks nice and roomy. It looks really great with these prints as well, I'm sure the tot is going to love it! Thanks for the giveaway! Beautiful and perfectly made bag, like everything you make and design. Thanks for the give away and for being such a generous blogger Ayumi. Hi! I love all your creations! This one is lovely! I like too much the fabrics you used! What a lovely fabric! Especially the crabs, they are very funny! i love the shape of that bag and the handles. 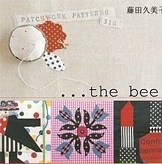 did you use a pattern? That is such a lovely bag, and lovely fabrics. I haven't been able to sew since my 5 month old baby was born, and seeing this bag gets me all excited and inspired! Super cute bag and fabrics. Thanks for the chance to win some. I love this fabric - and so would my daughter. She has a fascination with fish lately. I just love those boats! What cute fabric and bag! I just love that red crab fabric. Adorable! That's a lovely present. Thanks for a great giveaway. I live at the coast and these fabrics seem just like home. Thanks for the giveaway. Thank you for your lovely giveway. I will try my fortune :-) J. Your bag is great, great gift, lucky little boy. 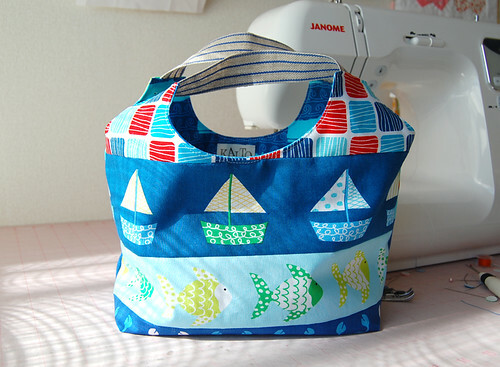 LOVE the fabric, have a grandson who loves ocean stuff so it would be put to good use. THanks for the giveaway. Getting a craving for Maryland crab cakes! Love those fabrics and these great colors. Wow, what two year old and his Mommy would not love that gift. It is so nice to see bright fun fabrics for boys. Thank you for this chance. That is one fabulous bag! It makes me smile just to look at it. Laurie's fabric is too cute! and i love the bag you made - perfect for carrying toys & books and fun things! What a beautiful bag...love the fabrics!! Thanks for the sweet giveaway! That is a beautiful bag! The fabrics are so cute and funny. Thank you so much for this wonderful giveaway! That is one cute bag, he's going to LOVE it. I know I would, it's so bright and cheerful. Perfect Beautiful fabric design!!!! I love the bag and the fabric! the bag appears to be the perfect size for shopping and going everywhere. And the fabric is whimsical and bright!